Here we go! 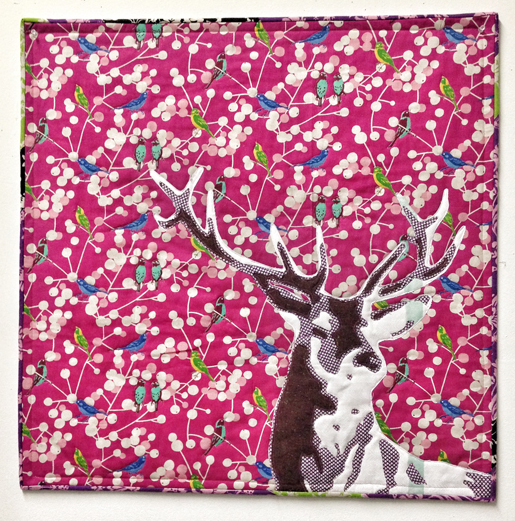 The last week of our Deer Quilt Sew-Along! 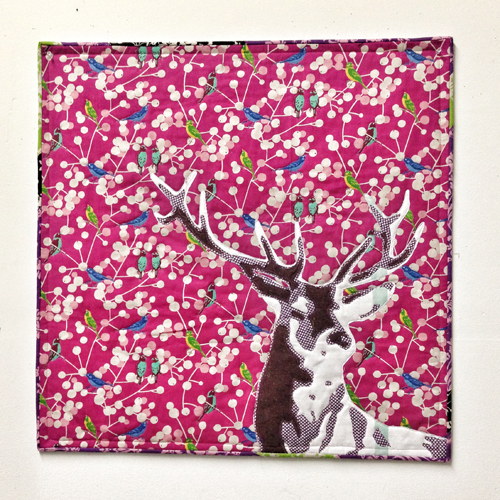 You have made a deer head. Now let’s finish this thing off! Week Four: Add the binding. Step 1) Cut the binding strips. 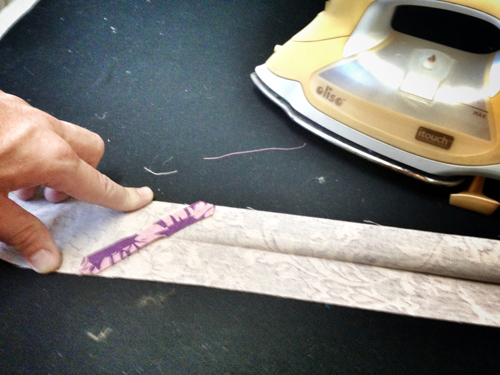 Step 2) Make the binding strips. NOW it’s time to make our binding! I have come to love this part. Choose the fabric(s). I chose three different colors so it will respond to different parts of the quilt, but that is not necessary, just a fun way to play. 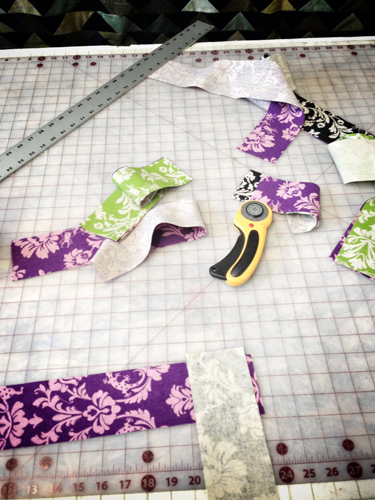 Cut 3ʺ-wide strips from your fabric(s) till you get more than you will need to make 120ʺ. I tend to go with WAY more, just because I know mitering the edges and turning the corners takes more than you think it will. There’s a lot of argument over the width of these strips. 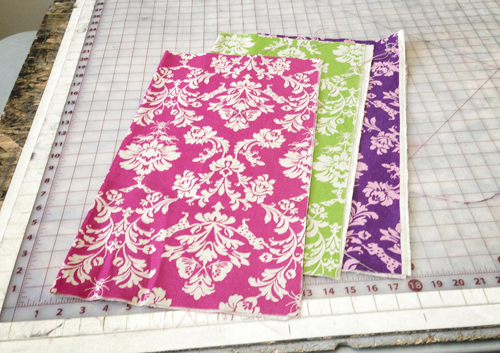 I use three inches for my quilts, so in this tutorial that is what we are using. If you are using multiple colors, think about cutting them into different lengths so the changes are not as visually noticeable. Now to put all the strips together into one long binding. This is important! 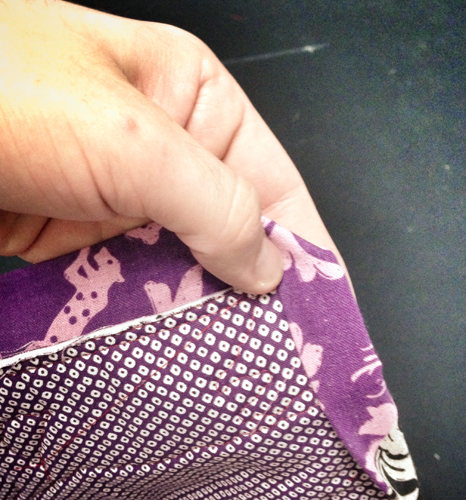 We are going to miter the seams here so we don’t have a lot of bulk when we fold the binding over itself six times. Start with your first strip face up, grab a second strip and place it face down at a 90° angle to the first one. Then seam along that diagonal like you see in the image, from the intersection point at the top to the intersection point at the bottom, taking care to hit that point as exactly as you can; it will make the rest of the binding process easier for you. 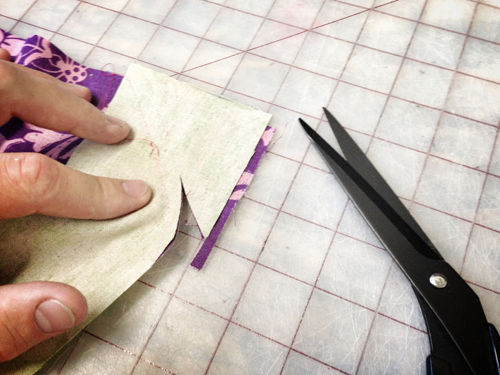 Take a pair of scissors and trim that seam allowance down to roughly a ¼ʺ; it can be a little bigger if you’d rather. 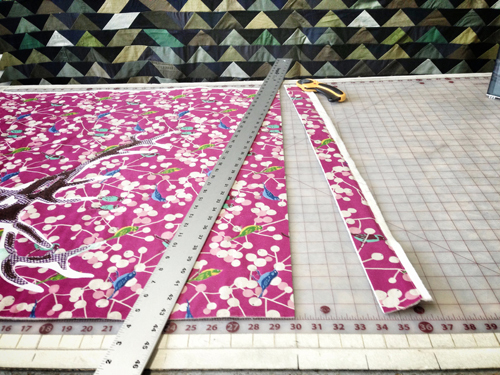 Once you’ve done this, lay this piece face up and grab the next piece of fabric and so on and so forth till you have a strip that is longer than 120ʺ by at least 12ʺ. Again, more is better. Iron each of these seam allowances open, so when you fold the strip in half the bulk will be out of the way. 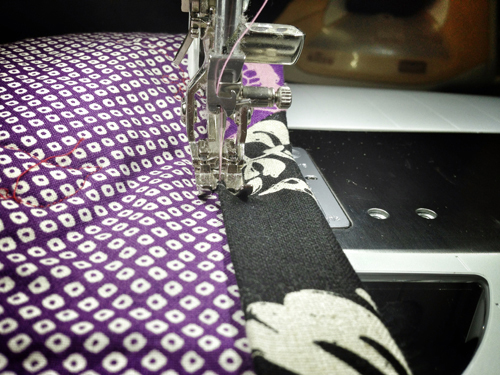 I tend to lay out a length of bias, press the seams, then fold it in half and press it again. But you can do the whole strip in stages if you want. Fold the strip in half. I fold toward myself so I can watch that overlap closely. Step 3) Bind the quilt edges. Let’s put the binding on the quilt! 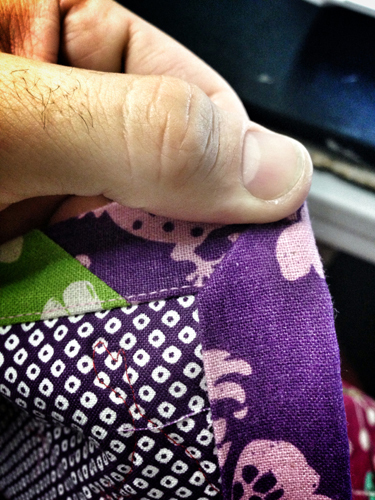 The thread can match the binding so it will blend in, or just be black and match the quilt top. You really won’t see it unless you pull really hard, so it’s not too much of a worry. Select a side of the quilt and lay the binding along it, raw edge to raw edge, starting at the middle instead of at a corner. I tend to go about ⅓ down a side, but not for any real reason except that starting in the exact middle would look too planned. 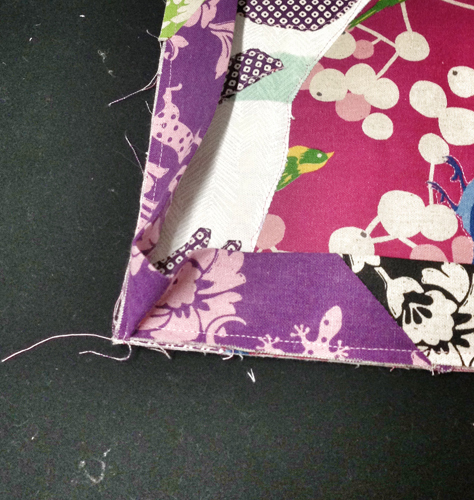 Sew the binding to the edge at ¼ʺ from the raw edges, starting 6ʺ or so from the end of the binding, leaving a tail for connecting later. You could use a wider seam allowance here, but that would affect the back, so try it this way for now and experiment later. When you get to the first corner, leave ¼ʺ unsewn; this will allow you to turn the corner. 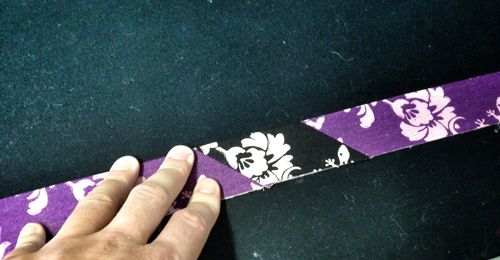 Fold the binding down toward yourself, holding the fold that is on the diagonal and overlapping it. What you will see looks like the binding is overlapping with the side you are about to sew on the top, and what is under is a double fold at a diagonal. Now just sew that side all the way down to the next corner and continue until you are about 10ʺ from the other end, where we started. You now have two floppy ends. Let’s just sew them square; this will lay fine. 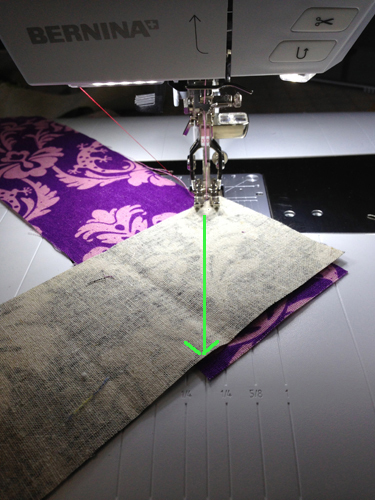 Overlap the two ends and cut the second one½ʺ PAST the startingside, so you will have seam allowance for when you connect them. 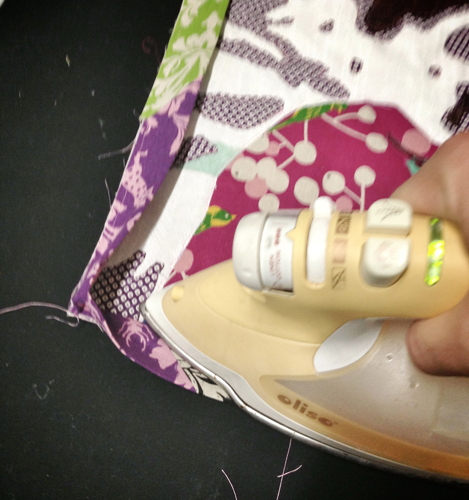 Press them face to face, making sure there isn’t a twist in the binding, and sew that ¼ʺ seam straight across (not like we did before on the diagonal). Then continue sewing along that side, starting just above where you left off and ending just a bit past the place where you started. Take it to the ironing table and press the binding away from the quilt, so it’s overlapping itself. No need to make sure it lays flat, just make sure it has a nice crease at the inside fold, getting into those corners well. Now here’s where my method differs from a lot of folks. I am going to sew the back with my sewing machine and be darned proud of it. Plenty of quilters take this as travesty, but we chose 3ʺ-wide strips to make our binding out of so it will come in far enough to make a nice little border stitch. Choose your bobbin thread accordingly, because that will be on the top of your quilt. 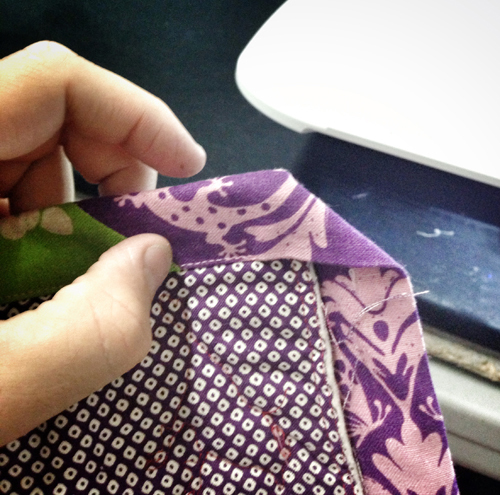 Grab a corner—any corner—and we are going to start sewing the binding on the back. Pull your binding around to the front and hold it at the corner. 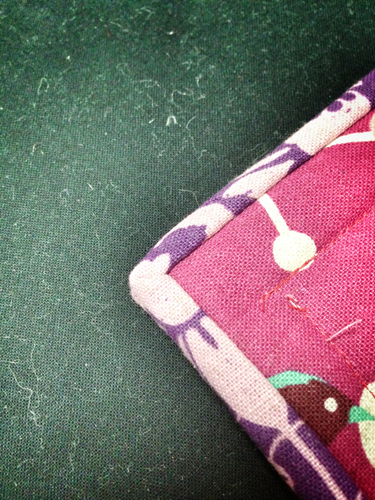 Start about ¾ʺ from the corner and sew right on the very edge of that binding. 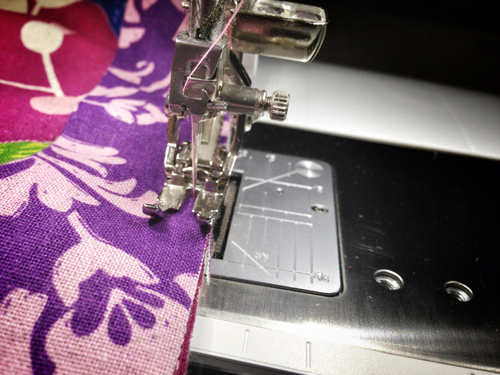 Sew all the way down until you are about that same ¾ʺ from the corner. Turn the quilt counter-clockwise “3 hours” (90°) and fold over the next side. 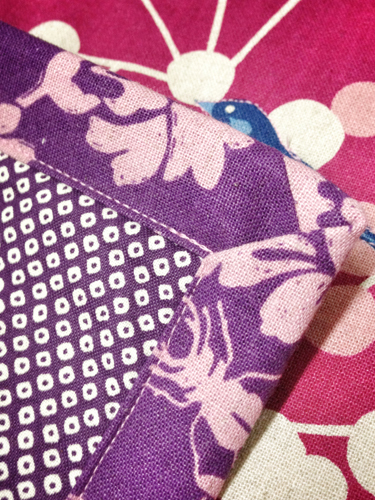 Now you see why we left that ¾ʺ unstitched, so the seams match up on the front. Flip it over and check your seam on the front. It should look mitered with the best of them! And you have that nice border thread that reinforces your binding. Pretty sweet, no? Show me how you do! Just now joining us? Catch up on Weeks 1-3 by clicking the links below.